The stamp is by Tiddly Inks. I stamped the image in Memento Tuxedo Black, and used Copics to colour it. 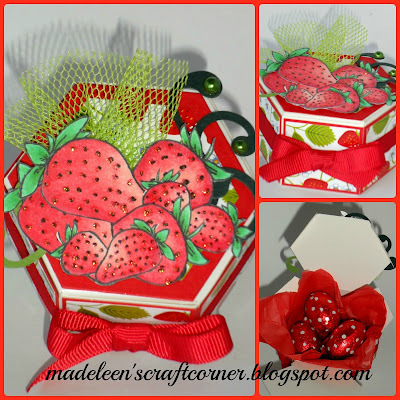 I followed this Kit & Clowder tutorial (by Alyce Keegan) for the colouring. I absolutely adore this image! It is super cute and just perfect! Well hi there and welcome back! The angels were designed by Karen Strubel and is entitled "United We Stand". This is available as a clear rubber stamp. I decided to use the images to decorate some treat boxes (which I cut out using my brand new Silhouette Cameo). I coloured the angels with Copic markers and added ribbon, twine and buttons. For this box I fussy cut the stars and overlapped them before gluing them together. I stamped the notecards using Memento Tuxedo Black ink and used my Copics to colour the image. I also sponged some Tim Holtz distress ink over the background. Lastly, I added some Stickles in green, red and blue before mounting the images on some BoBunny paper (Alora Collection). Yes, I know things have been very quiet on the blog front but alas that goes with the territory of trying to run a household, work part-time and try and upskill on the side! LOL I've had very little crafty time lately and the projects are piling up (not to mention the pent up craftyness). I seriously loooove the digi! She is super cute! I coloured her with Copic Markers and added some Stickles and Glossy Accents. The ribbon is from the Ribbon Carousel and the flowers are from my stash. For my next project I had to think outside the square. I also entered these into Paper piecing challenge over on StampTV. 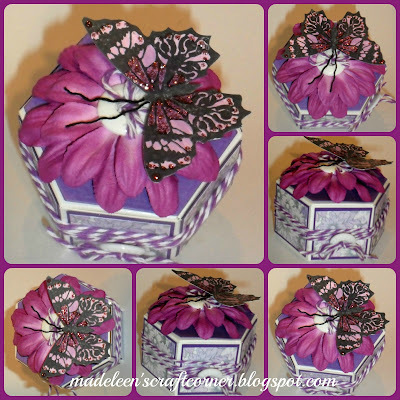 I used a butterfly stamp from the StampTV Spring Silhouette Kit. After stamping the butterflies, I fussy cut each one and then cut the wings off the butterflies and turned them into flower petals instead. Thanks for popping in! I'm hoping to show you some layouts in the not too distant future! Cardstock is GinaK Designs pure luxury in White and Passionate Pink. DP is from the Garden Girl Collection by BoBunny. Pearlies, flower & doilie are from my stash. I rubbed some Tim Holtz distress ink in Spun Sugar over the doilie. I added Glossy Accents, Stickles & Sharpie Poster-Paint dots on her cheeks. Cardstock by GinaK Designs pure luxury in White & In the Navy. DP from the Lost & Found Collection by My Mind's Eye. Nice to see you! Do hop over to The Outlawz and have a squizz at the inspiration picture - I'd love to see you play along this week!